Maybe I am one of those people who just isn’t supposed to have a fireplace mantel. Goodness knows it throws me for a decorating loop more seasons than not. However, even though I struggle to keep it updated, I *do* put stuff on it, and take it down, and put other stuff on it. Want proof? 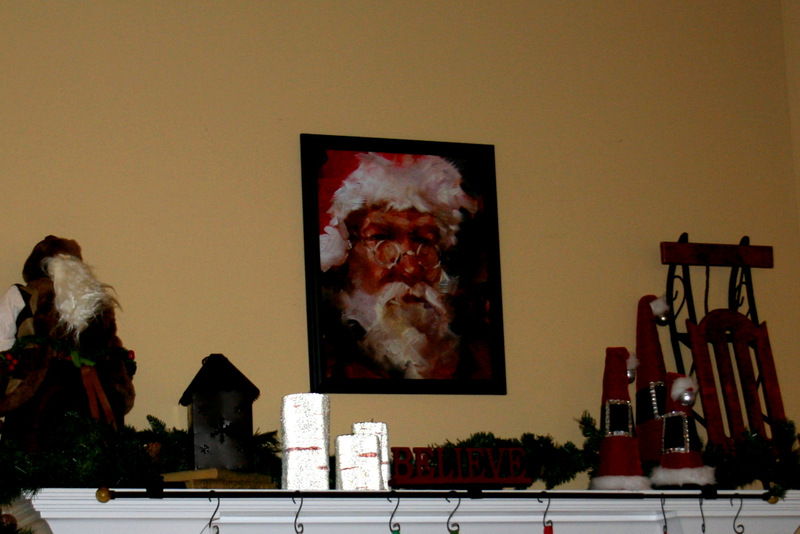 Here was the 2013 Christmas mantel. Awwww…. The miniature sled was something I snagged in an antique/thrift store down in Bell Buckle last year; I had planned to work it into an outdoor Christmas decoration, but at the last minute, I propped it on there, and it seemed to fit. Now let’s see if I can get myself in gear and update it before Easter. Hmmm. 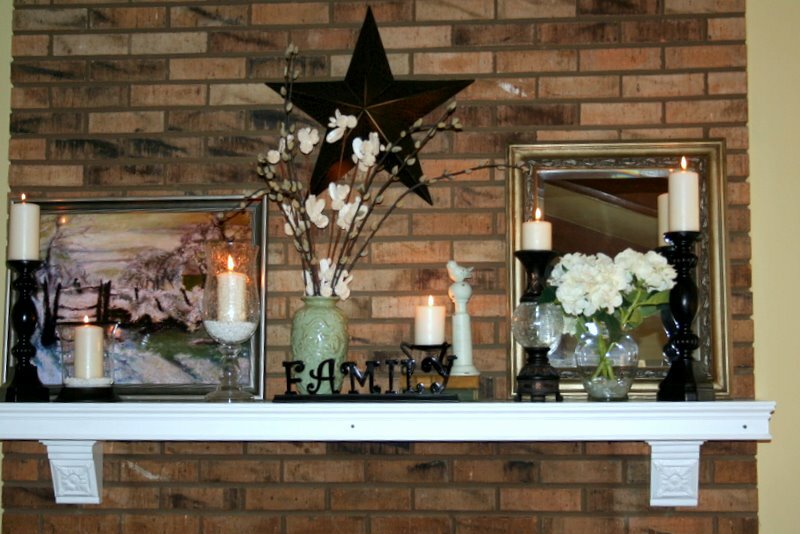 Maybe if I update the mantel and the dining room with a spring-y feel, this gray, cold winter will take the hint and take its leave? If only it were that easy, I’d dismantle the mantel today. I’m a little puzzled as to why dismantle is a fairly common verb, but mantle is only a noun in modern times; as a verb it is obscure – some might say arcane. Or why remantling isn’t a word at all. But setting aside the weird vagaries of the English language, it’s time for some seasonal adjustments to our mantel. 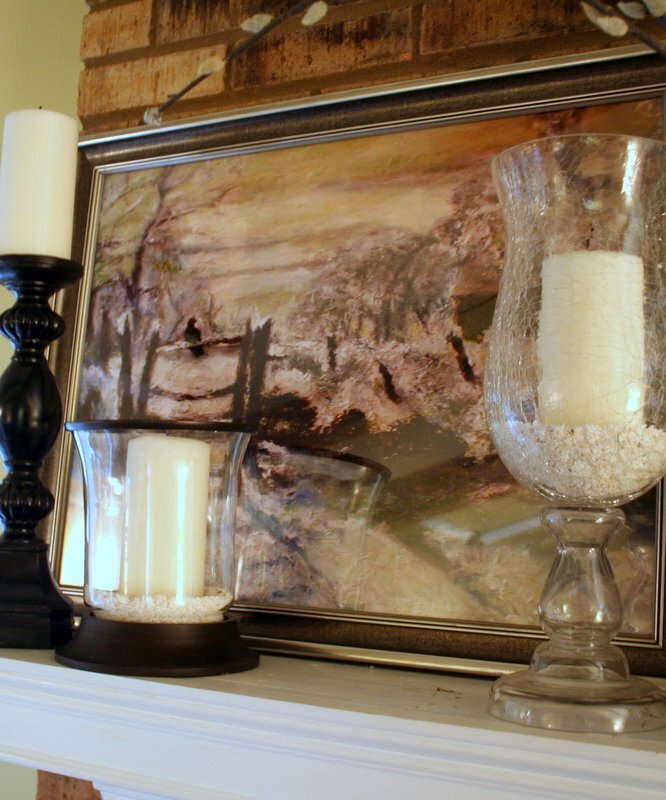 When we moved into this house, it was early summer and so the mantel was mantled with summery objects: sepia prints from South Carolina, along with sand and seashells. Now it is late summer (almost fall y’all!) and time to gently transition us into autumn hues without making it look like Hobby Lobby has taken over my house. Oh. my. goodness. Have you been lately? They have a giant Thanksgiving-bedecked Christmas tree to greet you when you walk in the door. Swimmer girl calls it a Thristmas Tree. And every shade of orange can be found in the waves and waves of pumpkins, turkeys and pilgrims, along with Halloween black cats and scarecrows. And of course, the Christmas stuff is oozing out all over the place – every time I walk in, it’s taken over a few more aisles with ornaments and stocking hangers and decorations. It’s like “The Blob” and almost as scary. Before I plunged in, I considered my options. I have a tub (or two) of fall stuff in the attic. And Mr. Official will be happy to know the floral stuff was recycled, and the candles and candlesticks are also re-used. 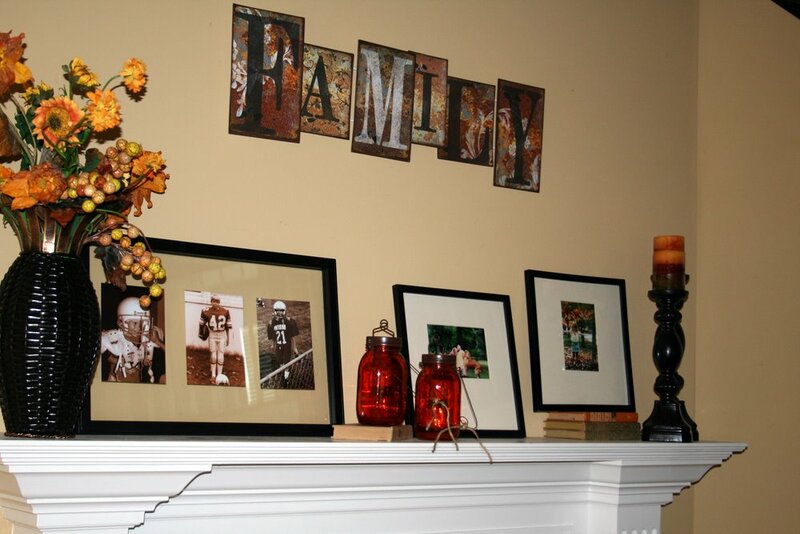 But I wasn’t quite ready for ALL the fall stuff, so I went through our old photos until I found some of our children’s fall pics I liked, then had them blown up and tucked them in frames. It’s definitely a departure from the mantles we’ve sported over the last few seasons. The other pictures will undoubtedly reappear at some point, either back on the mantel or elsewhere. 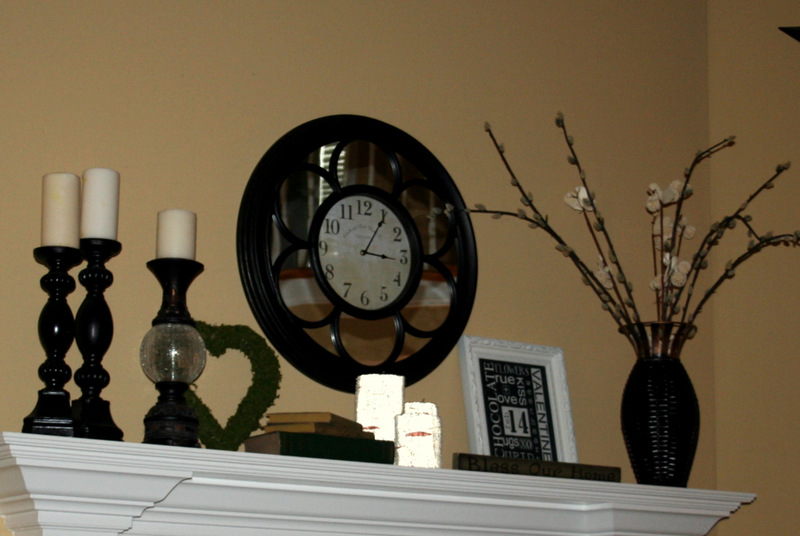 And like Hobby Lobby with a delayed reaction, I’m sure the mantel will slowly taken on more and more orange, then red. And green. 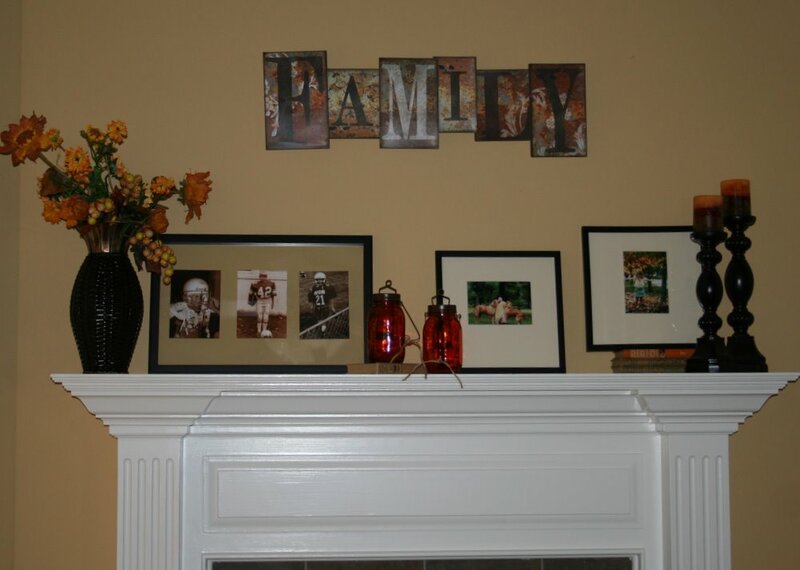 In each home we have owned, I have wanted (and gotten) a fireplace with a mantel. Last home had two fireplaces and three mantels (one fireplace was two-sided.) I love (REALLY love) having a fireplace. 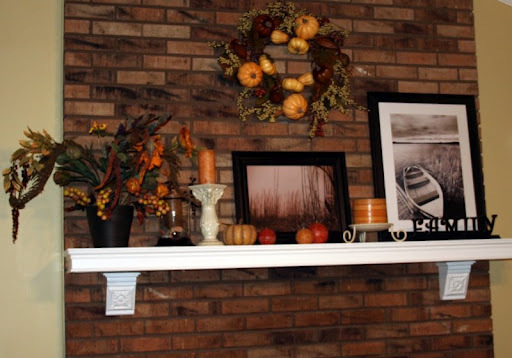 And – of course – a mantel. But decorating said mantel doesn’t come naturally to yours truly. 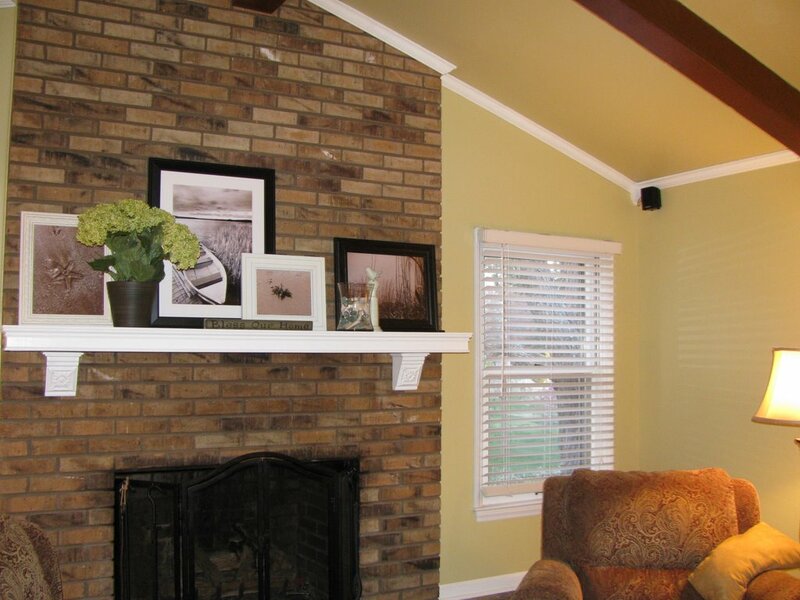 And this home’s fireplace has the added complexity of having a massive brick wall above the mantel. Everything seems to recede into the earth-tone brick. 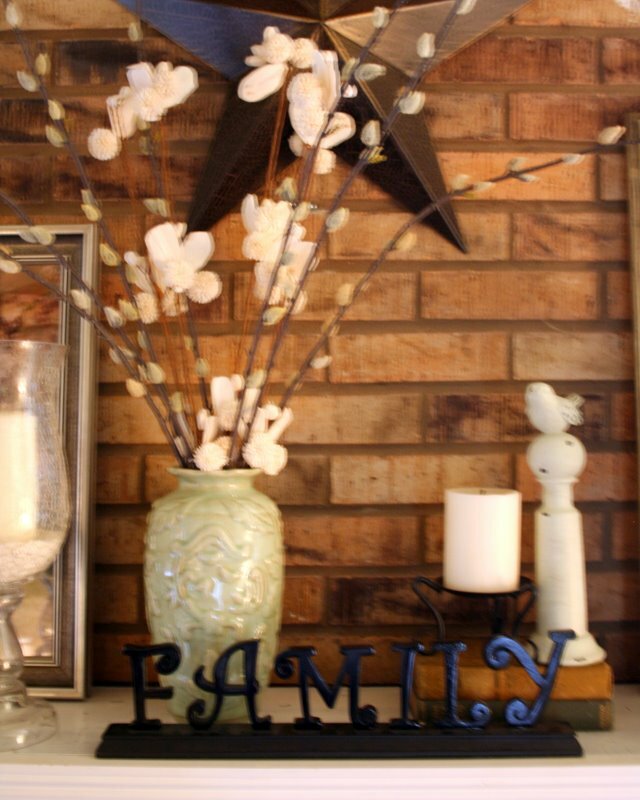 There was a complete and utter DEARTH of tasteful or inspired mantel decoration between the holidays and spring. Oh my. In retrospect, the scale was still a little small. Or maybe it’s just me thinking I should somehow cover that vast expanse of brick with SOMETHING? 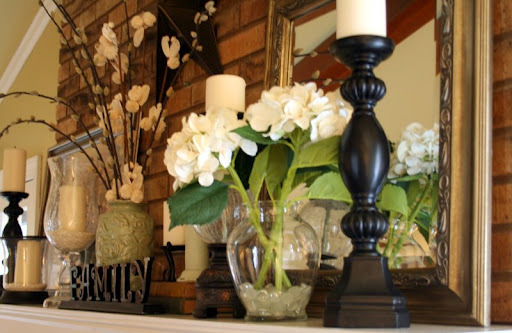 At any rate, spring and summer, the mantel stayed pretty much the same. Then came fall and I did pump up the orange with some seasonal items. A painting class scheduled for last week got canceled due to snow. Alas, it was going to be a painting of a winter wonderland scene, which I had hoped would grace my mantel until it is time for another trip to South Carolina. I decided it was high time to implement Plan B. (Well, to be more precise, it was time to create and implement Plan B. And now that you’ve heard all my excuses and rationalizing, here’s this year’s winter mantel. I started out with a print of Monet’s “Magpie,” one of my favorite winter scenes, in a brushed silver frame. In front of the print is a mix of old and new candle holders, with crushed oyster shells in the bases. Hobby Lobby had some fantastic closeout deals on the black candlesticks (which I really wanted last Christmas, so a very early “Merry Christmas 2011” to me!) ; their flowers were 50% off and I already had the vase sitting around collecting dust. The mirror was borrowed from the dining room. So what do you think? Will it carry us through these bleakest months weeks of the year? Any suggestions or ideas? I’m really hoping this mantel can be gently transitioned into a spring mantel in a couple of months. I like the idea of gradually changing it over every few months instead of a total overhaul each season. Especially since I seem to encounter a mental block when I’m faced with the prospect of a complete change-out. And in case you’re wondering, yes, we’ve thought about painting the brick or covering it with drywall and painting it the color of the walls, but our time in this house may be ending soon. If that happens, I’m not going to waste the time (and extreme energy) to tape and mud and sand and paint, especially dangling from a ladder, when the next residents may not appreciate or value my efforts. Of course, if we decide to stay put, then that may be high on my list of honey-do’s this spring. Indeed, Tennessee is Big Orange Country and it’s God’s Country. (Why else would He have made sunsets orange?) All half-joking and state pride bragging aside, it is time for fall and football – game two for Dooley and the boys today; the season opener for Jeff Fisher and our own Titans on Sunday. Who cares if the calendar says it’s technically fall or not? It’s in the air and it’s in our hearts. The hot tub is a perfect 100 degrees; the outdoor fireplace is all set with kindling and logs. Yesterday I switched my blog background and header and now it’s time for the orange blitz: orange jerseys, orange t-shirts, orange blankets, and orange pumpkins – and a new baby blue sweater for Sunday’s Code Blue. The weekend’s plans included a Friday evening dinner and catching-up time in Clarksville with some very dear friends from Oklahoma. Saying prayers for a safe trip home for this sweet family and wishing a special young man godspeed in his travels when he deploys with his unit on Monday. We’ll be counting down the days until he’s back. Tonight, us girls will rustle up some chicken wraps and catch the UT-Oregon game on ESPN. It’s a 6:00 kickoff so I encouraged Mr. Official to take our oldest son with him since I need to have my wits about me if I’m going to teach on Sunday morning. and those who have sacrificed so much to keep us safe ever since. Yesterday I made good on my commitment to paint the hall and den this month. Today my neck and legs are paying penance for the painting marathon. Here’s the “before” shot of the den. You can see the drywall patchwork on the ceiling (if I had a nickel for every drywall patch I’ve made in this house, I’d have a lot of nickels.) You can also see the mantel. In case you can’t guess, winter mantels are a struggle for me in my annual post-holiday funk. 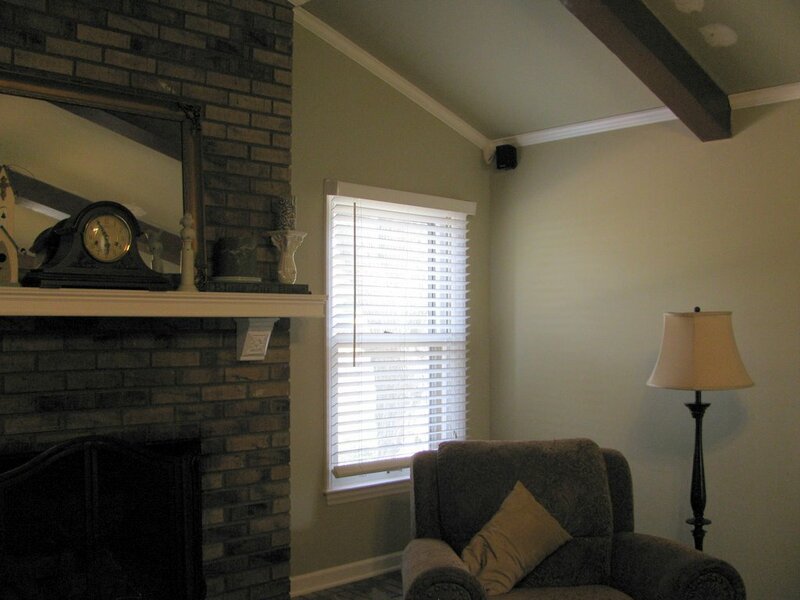 Anyhoo, the wall color is called “dried grass” and it’s decidedly in the green family, although it leans toward khaki. 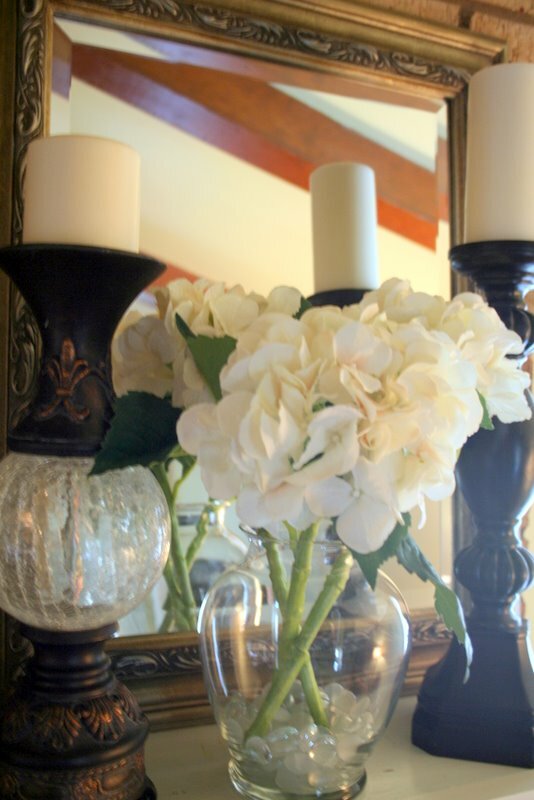 The new color is called “winter garden” and I used it to great effect (IMHO) in the formal living/dining room. It’s a mustard-y color, or so I thought. You can judge for yourself. After I got the walls painted, the men-folk in our family strolled in and both said “it’s the same color as before.” I harrumphed them out and insisted they were dead wrong. And they were…but if I were under oath, I’d have to confess the two colors are…well…similar. 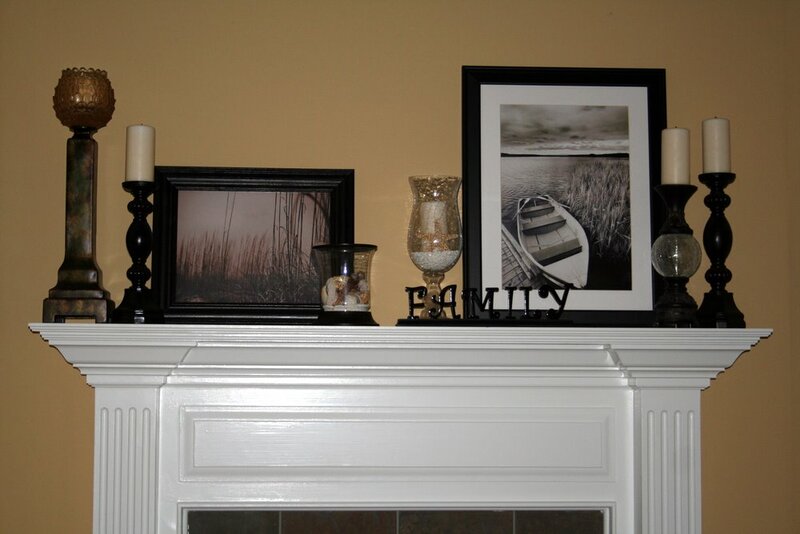 At least the mantel has been made over, thanks to some sepia-toned prints of photos my better half snapped while we were enjoying the beach in South Carolina. The biggest print is a rowboat in a marsh, a la Sparks’ “The Notebook” and was spotted by DD when I was getting the photos framed today. Good eye, that one. Takes after her mama. Of course, now that I’ve painted the den, the adjacent kitchen and breakfast nook are suddenly looking a little shabby. Sigh…this is how I have managed to paint every room of this house 3 times over in less than a decade.